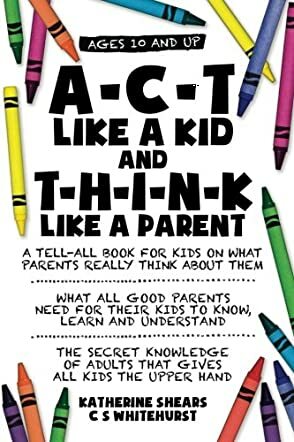 A-C-T Like A Kid And T-H-I-N-K Like A Parent by Katherine Shears and CS Whitehurst is packed full of advice for children on how to get on with and how to please their parents. It covers a wide range of topics pertinent to many children nowadays, explaining how parents think and why they make particular decisions and set certain boundaries. They remind us that all parents were once kids themselves, and will always be regarded as children by their own parents. Divided into nine parts, the book covers how parents think about their children, what they themselves have learned in the past, and how this affects the way they think and behave now that they have their own families. There are sections on trust, hygiene, obedience, equality between the age groups, things parents say and why, common sense, respect and managing money. The book covers every aspect you can think of that concerns young people who are beginning to question and challenge their parents, guardians and caregivers. The role of the child within the family is explained in detail, with some excellent ideas on getting what they want if they ask and approach their parents in the right way. It also touches briefly on those adults who may not be adept at raising the next generation. I’m not sure if this book is unique, but I wish I’d had access to it when I was a teenager and even later when I became a parent. A-C-T Like A Kid And T-H-I-N-K Like A Parent gives lots of helpful advice including one very important point - parents are not your friends, but are there to guide young people to become self-sufficient, good citizens, and active members of a happy, healthy family. They explain the ‘Secret Knowledge of Parents’ that older people have gained from experience and from their own mistakes in the past. This knowledge is not yet known to young people and explains why they so often misunderstand the boundaries and instructions given to them by their caregivers. This book helps to explain attitudes and reasons and it succeeds. The language is simple, though rather repetitive, and the glossary of words at the back is an added bonus for children. I felt there was rather a lot of emphasis on consulting therapists and psychologists, which may be more common in America, but rather unlikely in Europe and Australia. I suspect that most parents battle on without professional help or consulting self-help books. But, this is a book I would recommend to both children and parents and I wish it had been written years ago.